Observation Point vs. Angel’s Landing - it’s one of the biggest debates for hikers visiting Zion, and one you’ll likely encounter as well if you have limited time in the park. When my friends and I visited during our Utah road trip, we only had one day to enjoy Zion. After an initial debate on which hikes to do, we decided to tackle Angel’s Landing and then check out the Narrows for a bit. The day before we arrived, a massive flash flood hit Zion. Due to parts of trails being washed out, the park service was forced to close almost every major trail in Zion - including both the Narrows and Angel’s Landing. Lucky for us, Observation Point was still open - one of the hikes we’d considered during our planning. After successfully hiking to the top of Observation Point, I feel silly for not putting it at the top of my list all along. It’s an amazing hike and arguably better than Angel’s Landing (at least from what I’ve read and seen in other traveler’s blog posts). Angel’s Landing is a dream for adrenaline junkies. With sheer drop offs on both sides of the trail and nothing but a chain to hang onto, it’s a trail for those with sure-footing and calm nerves. If you’re traveling with small children or are afraid of heights, Angel’s Landing probably isn't for you. In this YouTube video, you can see just how narrow the trail is. There is hardly enough room to walk in one direction, let alone for people coming the other way. On the flip side, Observation Point is much safer. The trail is plenty wide enough for two-way traffic and there aren’t any sections with drop offs on both sides of the trail. I personally get really freaked out about heights, yet I never felt unsafe hiking Observation Point. Without doing much research, you may see pictures of the view from Angel’s Landing and decide that’s your hike. Angel’s Landing, after all, got its name because people say its so high only angels can land on it. The way I think of it, if you hike to Observation Point, you get the view from Angel’s Landing, plus a view of Angel’s Landing. Observation Point is a little less popular than Angel’s Landing, and therefore less crowded. Fewer people hike Observation Point because it’s longer than Angel’s Landing, has a steeper elevation gain, and because it does not have the same level of name recognition. 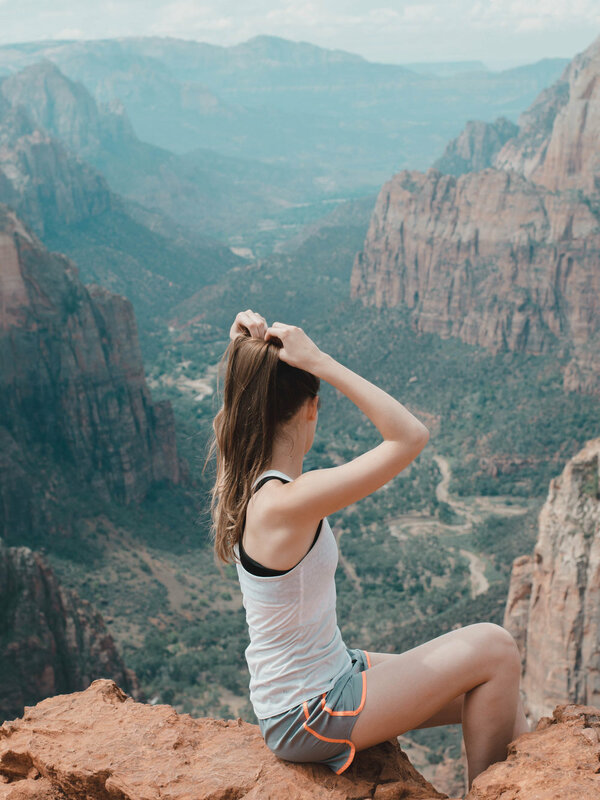 As more and more people post about their ‘daring’ and ‘exhilarating’ Angel’s Landing hike, it has become somewhat of a bucket list experience for adventure seekers. One one hand, the increased fame of this hike is great for bringing tourism to Utah and Zion National Park in particular. However, Angel’s Landing is so popular now lines of people form at certain sections of the trail. With Observation Point being much longer than Angel’s Landing, even a busy day feels like a peaceful one. This is because there's more room for people to spread out and go at their own pace. Remember, I’m slightly biased. I haven’t actually hiked Angel’s Landing myself and have a severe fear of heights. Do your research and see if Angel’s Landing would be a better fit for you than Observation Point. The reason I wrote this post was simply to shed light on a lesser-known hike in Zion, and to let people know there is a safer, and potentially better option than Angel’s Landing. For a great article about what hiking Angel’s Landing is like, check out Conquering Zion’s Dangerous Angel’s Landing Hike by The Mandagies. Another good read is an article by Be My Travel Muse called Observation Point vs. Angel’s Landing in Zion, Which is Better? 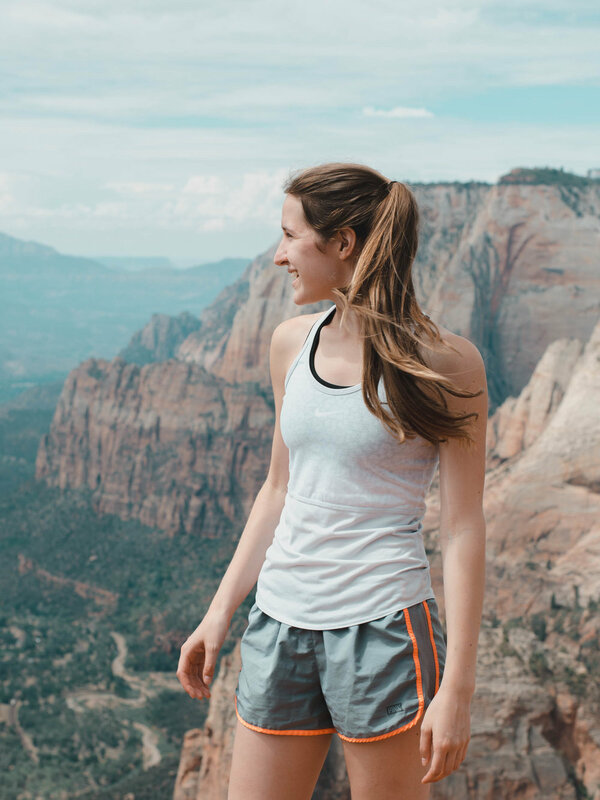 Kristin, the author behind Be My Travel Muse, has hiked both Observation Point and Angel’s Landing, and discusses the pros and cons of each. For a hike as long as Observation Point, make sure and start early. Not only will it be cooler in the morning, there will be less people, and the lighting in your photos will look better. Stay and enjoy the view for awhile once you reach the top. We packed apples and sandwiches on our hike, and eating them definitely helped us stay fueled for the full 8 miles. There are also adorable, little chipmunks running around waiting for you to drop a snack (please don't though, human food isn't good for them). Always, always, always bring plenty of water on any hike you go on. For hiking Observation Point especially, make sure you're loaded down with extra water bottles, or a decent-sized hydration pack like this one. It gets really hot on the trail when the sun comes out, and the switchbacks are insane. If you've read a few of my blog articles, you won't be surprised to know I wore regular tennis shoes for this hike. While it was a perfectly doable hike in them, the bottoms of my feet were really sore the next day. To avoid this, wear actual hiking shoes. Your feet will thank you when you're done. While absolutely gorgeous and worth the climb, hiking to Observation Point can really knock you out afterwards. To reward yourself for your efforts, I recommend treating yourself to some relaxing accommodation afterwards. After our own hike, my friends and I went glamping near Zion National Park. It was the perfect mix of outdoor adventure and comfort. Planning a Utah road trip? Check out my Utah road trip itinerary. It’s full of information and ideas on what to do in Zion, Bryce Canyon, and Arches. 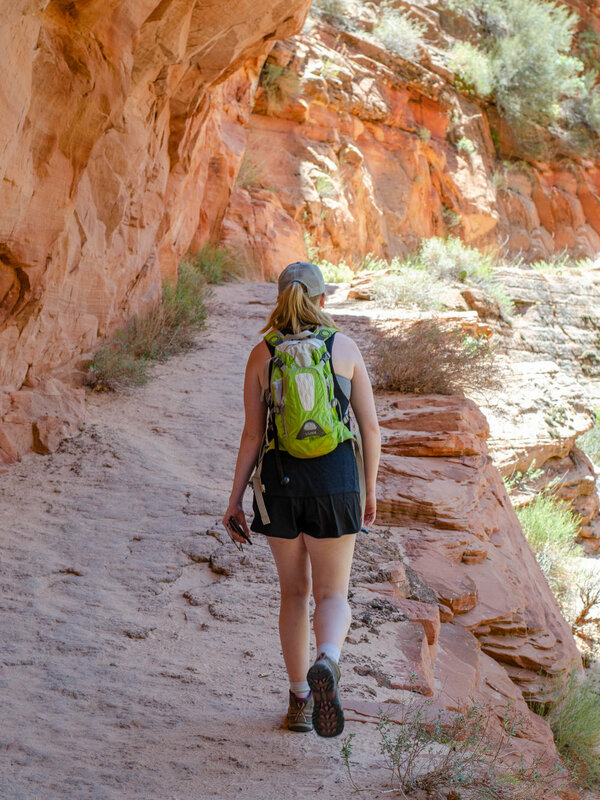 have you done either of these Zion hikes? Tell me about your experience in the comments below.